Attached please find our West Bouldin Creek Greenbelt-Trail Signage Plan-Thanks to Ingrid Weigand, our parks committee and volunteers. We did a second sweep of the greenbelt today, this time along the railroad tracks, collecting a out 30 bags of trash, plus lots of cardboard a few larger items and a few bags of recyclables. 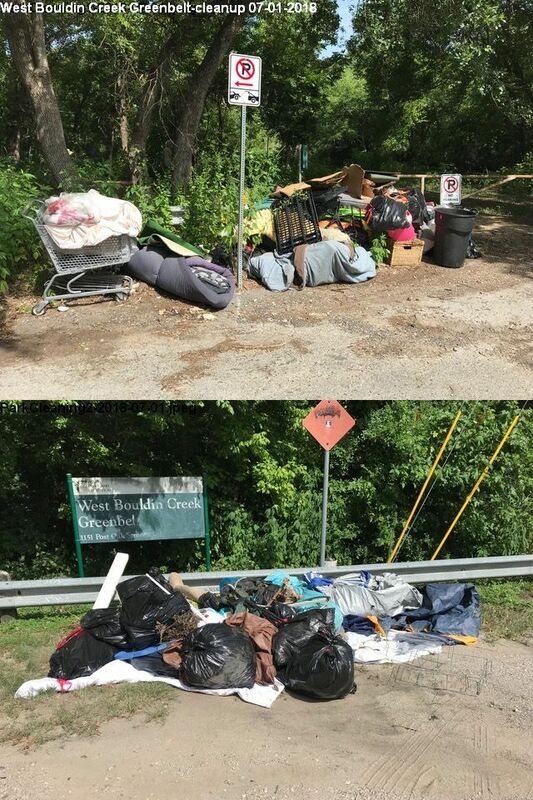 We had a very successful clean-up of homeless camps on June 30, but were only able to cover part of the greenbelt. There are still remnants of camps along the railroad track path; in addition, the recent rains have washed in trash from South Lamar, most of it now in the creek bed. I have walked the main trails several times last week and no new camps have been established – that is the good news. One more push to get the greenbelt cleaned up should do it for now and hopefully entice many more of you to use this wonderful green space. Please wear long pants, long-sleeved shirts and sturdy boots and bring work gloves as well as water. We’ll supply trash bags and wheelbarrows to haul them out. The weather held up and everyone had a very good time. For quite a few participants, this was the first time they had spent in our wonderful greenbelt.. Thank you every one who helped, especially the team leaders! In this life, I’m always going to choose the positive.